The Interactive multimedia performance including dance, animation and installation was shown in Changmu Theater in Seoul, Korea in 2002 for the Master of Fine Arts degree thesis project for the Multimedia Animation major at Sejong University. The performance explores interactions between virtual cinematographic animation techniques and dancer choreography within a simultaneous performance. This interdisciplinary performance has influenced the Organ-machine Hybrids’ merging of different disciplines into one project. The interdisciplinary performance illustrates emerging new media art’s fascination with the human body form. The animation shows the chronological development of the human beings’ tools and technology and traditional media, which are used to communicate with each other, such as languages, electronics, machines, and internet. Mankind’s expanding tools and materials as “new media” ironically oppress the human beings by dehumanizing communication, a negative side of technological society. 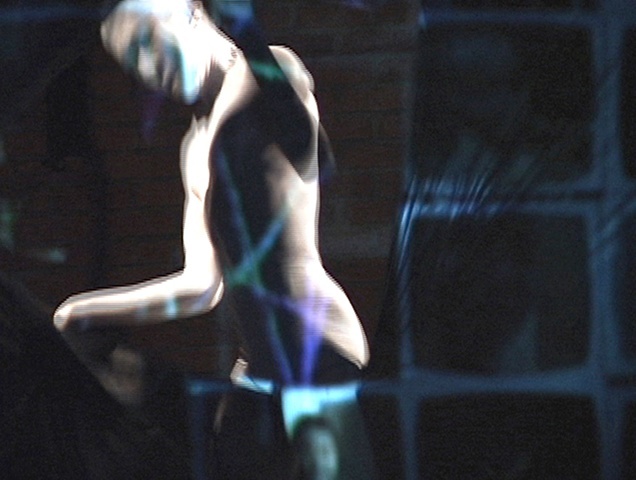 In the performance, the performer finally tears the screen frame and shows the animation of the robotic heart with the dancing performer, which illustrate the expanding humanization of media and more dynamic new media forms with the human body. The destroying screen performance also represents the blur of the boundaries in the contemporary art. This multimedia performance illustrates the optimistic views of technological progress for expanding human beings’ media, which will be increasingly humanized. The animations and dancing performers harmonized on a theater stage. The dancers perform all over, around, and in between projecting animations on the screen and the walls, and the installations of many LCD monitors which also play the different sections of the animation. The music, animation, dance, and installation were well harmonized through a detailed scenario. However, the performance was only choreographed without the access to real-time interactive technology (with sensors and motion controllers), which stimulated me to decide to study and develop technical processes in my new media artwork in the United States.